Sweet holiday dreams are made of this! On the the bottom is a joyful flurry of little red and white striped candy canes dancing all over the background, along with little star-shaped bright red flowers and berries and pine needles and snowflakes. 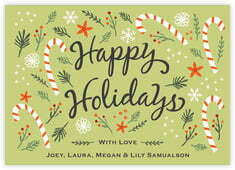 The joyous hand-scripted letter style speaks eloquently of your joy, you need say no more with this holiday style. 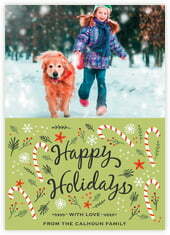 Customize your Floral Candycane christmas photo cards today! Floral Candycane Christmas photo cards are flat, with the design on one side that allows room for your personalized text and your choice of colors, and coordinating design on the back. Evermine photo cards come with matching envelopes, beautifully boxed in their own specially designed packaging. And the cards are perfectly ready to use as is, or to be given as a gift. You can also have your envelopes printed with your return address in a letter style to match your cards too. Christmas photo cards measure both 5" x 7" vertically or horizontally, and you have a choice of four papers—our luxuriously thick signature white or cream, signature textured white, or shimmer white. Choose a color, shape and then select the green "Personalize" button to start customizing your Floral Candycane Christmas photo cards with Evermine today!